General Hospital (GH) spoilers tease that one ABC soap star is facing a heartbreaking situation. Plenty of GH fans out there have beloved pets that are truly part of the family. It’s especially tough to let go of one you’ve had for many years. Unfortunately, James Patrick Stuart (Valentin Cassadine) is preparing to do just that. He shared some devastating news with viewers, so we’ll fill you in. This is certainly a difficult blow for Stuart and his loved ones, but it sounds like Delilah has enjoyed a wonderful life. No amount of time could ever be enough, but 12 years is still a great run. Delilah undoubtedly helped her family make some happy memories along the way. They’ll be able to cherish those when she’s gone. It’s always nice to think of better days when a pet’s passing draws near. On a happier note, Stuart often shares little glimpses of personal life like this. Valentin is far from soft and cuddly, so it’s fun when Stuart shows how different he is from his portrayer. It proves he’s a fantastic actor! 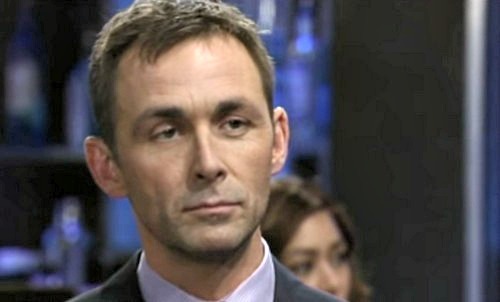 Stuart is excellent as a scheming villain, so GH fans are lucky to have him on our screens. As for what’s ahead on the ABC soap, General Hospital spoilers say big trouble’s brewing. Valentin has a secret partnership with Peter (Wes Ramsey) and it’s bound to blow up in his face eventually. He should land in hot water with Jason (Steve Burton), Drew (Billy Miller), Maxie (Kirsten Storms), Lulu (Emme Rylan), Anna (Finola Hughes) and of course, Nina (Michelle Stafford). There’s a good chance Valentin and Nina’s marriage will end up on the rocks once again. Are you rooting for them as a couple or would you rather see a dramatic split? We’ll give you updates as other General Hospital details emerge. Stay tuned to ABC’s GH and don’t forget to check CDL often for the latest General Hospital spoilers, updates and news.